Hello! This post is for people with stained teeth. Do you think yours are too stained for teeth whitening to have any effect? Think again! At Flax Dental in Atlanta, we are whitening smiles for patients with both intrinsic and extrinsic stains. Extrinsic stains are caused by dark colored foods and drinks, smoking, and normal aging. 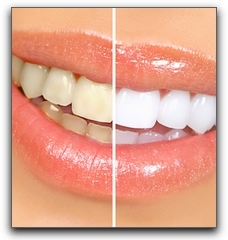 People with extrinsic stains get great results from both in-office and take-home teeth whitening systems. Intrinsic stains form on the inside but can be seen from the outside. Tetracycline (an antibiotic used in many medicines), excessive fluoride, trauma, and aging can cause intrinsic staining for some men and women. Though these stains are harder to remove, many patients with intrinsic staining can whiten their teeth with take-home whitening kits. The process often takes longer, but with persistence, intrinsic stains can be lightened. Teeth whitening is just one of the cosmetic dentistry services provide by Flax Dental in Atlanta. Call our office today to schedule an appointment.